Diamond Details: Round brilliant cut white diamonds, of I color, SI1 clarity, of excellent cut and brilliance, weighing .64 carat total. 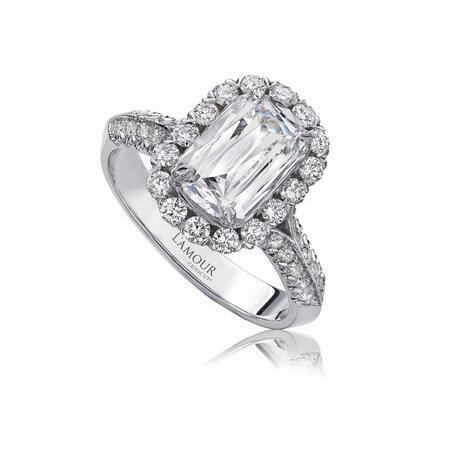 Ring Details: Christopher Designs L'Amour crisscut. Accomodates a 1.5 carat center stone. This dazzling Christopher designs 18k white gold engagement ring, features round brilliant cut white diamonds, of I color, SI1 clarity, of excellent cut and brilliance, Weighing .62 carat total. This setting accomodates a 1.5 carat center stone. The price does not include the center stone. Available upon request but sold separately. Its distinctive design features 50 facets and two straight sides with subtle curvatures at the top and bottom that create a brilliant reflection like no other, making a powerful and luxurious statement. L'Amour Crisscut is available in a range of sizes and customized styles.